The Paris-Oasis is an unique & wonderful place in Paris. 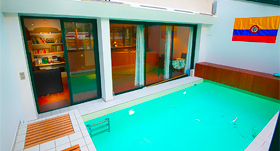 It features a free high-speed wifi, an indoor swimming-pool, a private garden with 2 stages, outdoor furniture & a fountain. Some units include a garden view & seating area for your convenience. Enjoy a cup of coffee from the Pergola, the main stage or the private courtyard. Each room has a private bathroom. For your comfort, you will find some slippers & complete toiletries. A free mini-bar & a flat-screen TV for each room. DVD player is offered only for the Suite & the Loft. You will find a shared lounge & library. Sacré-Coeur is only 200 metres from Paris-Oasis. Concert Halls & cabarets are close too. The nearest airport is Roissy Charles-De-Gaulles Airport with 23 km & Orly airport, 28km. On a trendy, quiet street in Montmartre, located at the foot of the famous Sacre-Coeur Basilica, Alexis warmly welcomes you to the Paris-Oasis. Indeed this wonderful and uniquely attractive guest house offers to a courtyard, an indoor heated swimming-pool (1,40 meters of depth – 30°) and a beautiful private garden. I live on the property and my 4 high quality furnished flats, from 12 to 44 m2, can be rented separately or together for singles, couples or families that are seeking a comfortable homestay in Paris (from 1 person up to 13 people). The minimum of the stay is 2 or 3 nights for either business or pleasure with constant prices through all the year. Within each unit you will find cooking arrangements ranging from a small cooking area to a full range kitchen.